This episode is a take-off on "The Godfather." Wyatt wishes for a more close-knit family. So Lisa puts the whole family under a spell. Instead of the Donnelly family, they become the Donelli family. Terrors of the homeowners association. 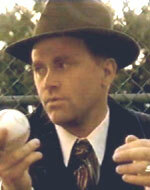 Chett plays the part of Sonny, and his Dad is the godfather. Wyatt plays Michael. Chett teaches Wyatt the family business, which involves strong-arming little kids. They force little girls with lemonade stands to pay them a cut. They bribe little leaguers to throw games. Gary’s father, Al, hates the Donelli family because they want to force him to take down his tacky Christmas decorations. In May. The two families go to war. The show mimics the scene where Sonny gets killed at the toll booth. Only here, Chett was sprayed with dozens of water guns. It 's pretty hilarious. He also spends a lot of time walking around in white wifebeaters, just like Sonny did. The families finally agree to sit down and negotiate, and Wyatt tries to bring the peace. Al keeps egging Wayne on. Wyatt snarkily remarks, “What’s next? Gunplay?” And everyone brings out weapons. Chett says, “Good thinking, bro. I guess these things are good for something more than just accessorizing. Let’s play.” He gets that tough look on his face. They finally settle things with a tug of war. Wyatt declares Gary and himself co-Dons and the feud is buried just as the spell ends.